The McKinnon-Tucker family poses at a family party in the backyard of Maureen's Auburndale Road home in Marblehead on Sunday afternoon. 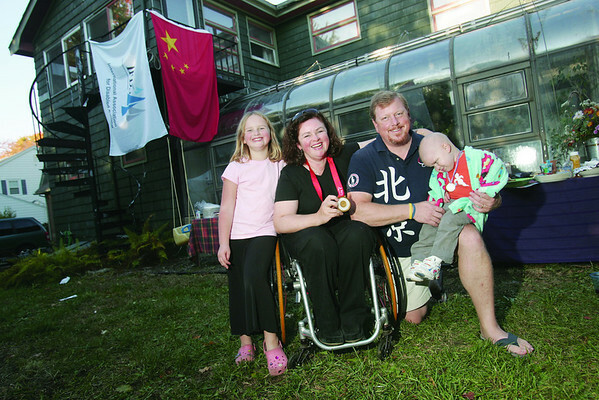 The McKinnon-Tucker's had much to celebrate, with three-year-old son Trent's recent birthday and successful fight against cancer, and Maureen McKinnon-Tucker's gold medal win for sailing in the Paralympic Games in China this summer. From left to right, Dana McKinnon-Tucker, 8, Maureen McKinnon-Tucker, Dan Tucker, and Trent McKinnon-Tucker, 3.